For the first time it is possible to deploy an integrated hardware platform that brings mainframe and distributed technologies together: a system that can start to replace individual islands of computing and that can work to reduce complexity, improve security, and bring applications closer to the data that they need. With the zEnterprise System a new concept in IT infrastructures is being introduced: zEnterprise ensembles. A zEnterprise ensemble is a collection of highly virtualized diverse systems that can be managed as a single logical entity where diverse workloads can be deployed. Ensembles, together with the virtualization, flexibility, security, and management capabilities provided by the zEnterprise System are key to solving the problems posed by today’s IT infrastructure. The zEnterprise CPC can either be a zEnterprise 196 (z196) or a zEnterprise 114 (z114). Both zEnterprise CPCs offer z/OS, z/VSE, and z/TPF operating systems, as well as the ability to run many virtualized Linux servers under the z/VM operating system. The zBX provides the capability to run the wide variety of applications typically found in UNIX and x86 architectures. The zBX supports select POWER7 blades running AIX and System x blades running Linux on System x and Microsoft Windows. Unified Resource Manager runs in the Hardware Management Console (HMC). It provides integrated management across all elements of the zEnterprise System. 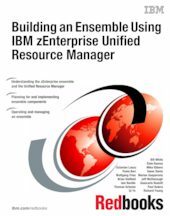 This IBM Redbooks® publication discusses how to plan and implement an ensemble, using the zEnterprise Unified Resource Manager. This book assumes a knowledge of IT systems, networks, and storage devices.